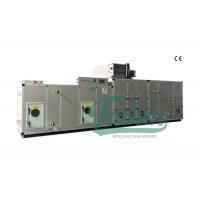 ZCH-8500 Industrial Desiccant Dehumidifier is for air deep drying, which is used for manufacturing spaces and processes that require extremely low humidity levels. 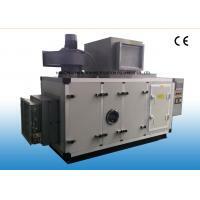 It can supply air with dew point less than -60℃ to glove box for the production of lithium batteries. Outside air is drawn into the unit using the supply fan. 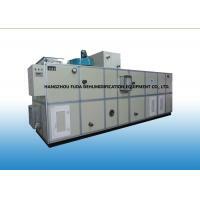 The warm, moist outside air first passes through filters and then the cooling coil where it is cooled. 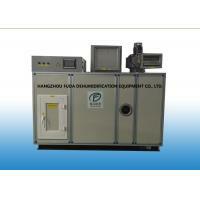 The air then goes through the first desiccant wheel where the air is dehumidified and the temperature is raised. 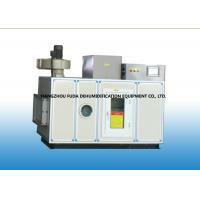 After the medium cooling, the air is further dehumidified by the second desiccant wheel. 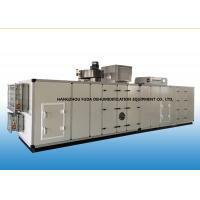 At last the air is delivered directly to the space or into an existing air handler. 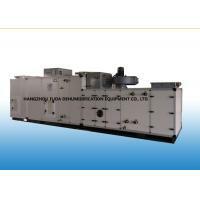 Electric or steam heating or convert type can be available. 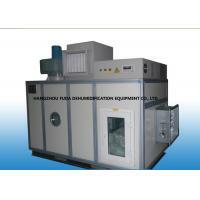 We can make suitbale dehumidifying solution for you according to your requirements. 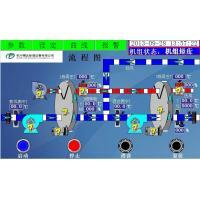 If you are interest on our product, contact us now. 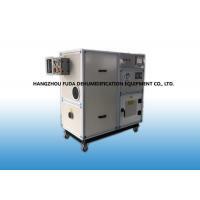 Hangzhou Fuda Dehumidification Equipment Co., Ltd. is a National New and High-tech enterprise, which is the first established manufacturer in China specializing in R&D and manufacturing of desiccant rotor dehumidifiers and providing design and installation service for various HVAC projects. 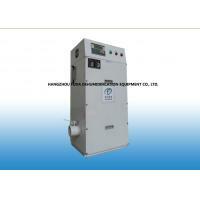 Our company was founded by the engineer who has participated in the research and trial-manufacture of the first desiccant rotor dehumidifier in China in 1995. We have a team of professional technicians who have 40 years’ experience of R&D, structure design, production, installation and adjustment of desiccant rotor dehumidifier, building a complete set of scientific, religious production arts and crafts, assembly and adjustment criterion, and own international advanced Vaisala temperature and humidity meters and low dew point test instruments. 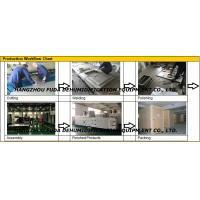 The rigorous test method guarantees the advancement, stability and dependability of “Fuda” products. Fuda company pays great attention to absorption of the advanced technology both at home and abroad since its foundation, cooperates with the international famous silica gel molsieve rotor manufacturers, Sweden-based Proflute and Japan-based Seibu Giken, feeds back the market information in time, extracts the beneficial experience, and keeps R&D and innovation, improves product quality, making Fuda product in a leading position in China. Our company has passed ISO9001:2015 certification and obtained CE certificates for our products. 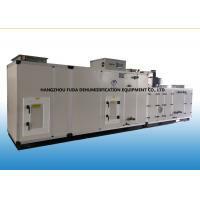 At present, Fuda company has formed ZCS Series Desiccant Rotor Dehumidifiers, ZCB Series Desiccant Rotor Dehumidifiers with AHU, ZCH Series Low Dew Point Dehumidifiers, ZCH-W Series Glove Dedicated Super Low Dew Point Dehumidifiers, ZCY Series Four Season Moveable Dehumidifiers, ZK Series Constant Temperature Dehumidifying AHU, ZKW Series Constant Temperature and Constant Humidity AHU, and DJ Series Refrigeration Dehumidifier etc. eight series with hundreds of models. Our products are widely used in war industry, nuclear electric station, railway station, shipbuilding, biology pharmaceutical, food, lithium-battery, medical instrument, fine chemical, rubber tyre, electric instrument, safety glass, film, plastic, wood molding, fruit and vegetable cold storage, electric power equipment, altitude academy laboratory etc. industries, and is exported to America, Brazil, Japan, Korea, Australia, Thailand, Pakistan, India, Sikkim, Vietnam, Indonesia, Saudi Arab, Jordan, Venezuela, Hong Kong and other countries and regions. Thanks to the 40 years’ experience of dehumidifying practice, fully playing the dehumidification professional knowledge, building featured constant temperature and constant humidity dehumidification systems for kinds of industries, providing turkey project integrated by temperature and humidity control, water, electricity, cleanse, Fuda Company is highly praised by customers both at home and abroad, becoming the famous brand in the field of domestic desiccant rotor dehumidifier.